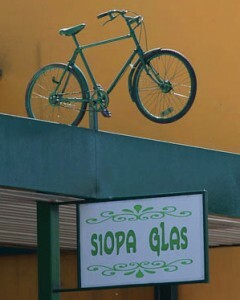 Why not open a ‘Siopa Glas” staffed by local volunteers like Ballon village in Co. Carlow has done. The shop’s aim is to minimise waste in the community by providing a friendly service for taking unwanted items off peoples’ hands, while at the same time giving a local opportunity to get high quality clothes, furniture, household items, books and vintage bits and pieces at knock down prices. Bird boxes and bird tables made by the local Mens’ Shed have also been sold from the Siopa. The Siopa Glas is now the main source of funding for the Ballon Improvement Group and the money raised is used to enhance the village, the Ballon school garden and the wildlife area. A regular garden swap shop is held too. For more on Ballon Siopa Glas click here.